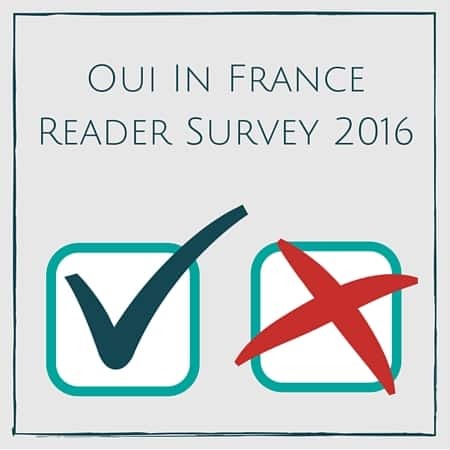 The Oui In France reader survey is now closed and the results are in! 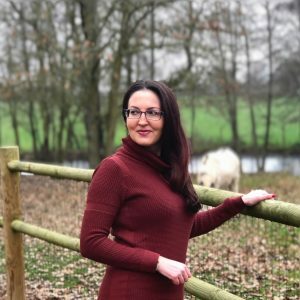 If you’d told me back in 2012 when I started the blog that by the beginning of 2016 I will have posted over 440 posts and written consistently twice a week, I wouldn’t have believed you. The time, energy and commitment that goes into maintaining a blog would have seemed insurmountable. But here we are in 2016. 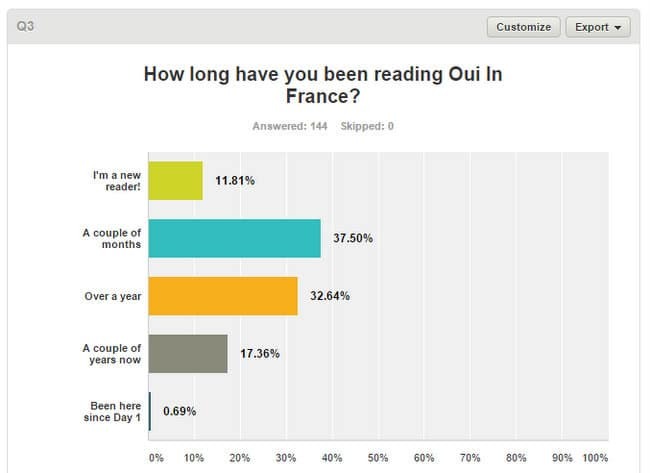 Oui In France has grown with each passing year, thanks to you readers, and it was time for your feedback! So let’s get to the results! A heartfelt thanks goes out to each and every one of you who took the survey. And as it turns out, there were way more of you than I expected! Getting people to take a blog survey is like pulling teeth and at most, I figured maybe 50 or max 75 would reply. But a whopping 143 people replied! 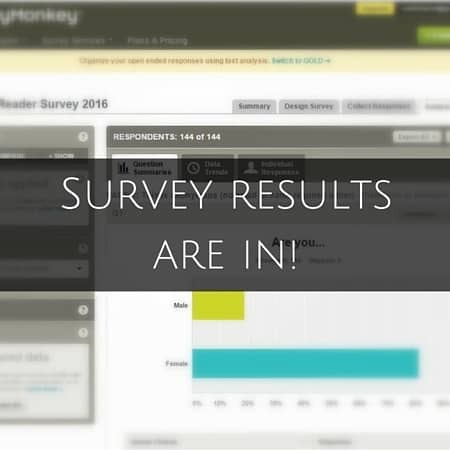 FYI bloggers out there, after 100 responses have been recorded in SurveyMonkey, you have to upgrade your plan to the paid option to access the results (no one-time option only, so you pay for the whole month). So bloggers out there, be aware of that! Short answer is I was curious. I had my own thoughts about who my most engaged readers were and wanted to see if my ideas were in line with reality. I know what posts get the most shares but are they faves of my regular readers? Are most of you expats? 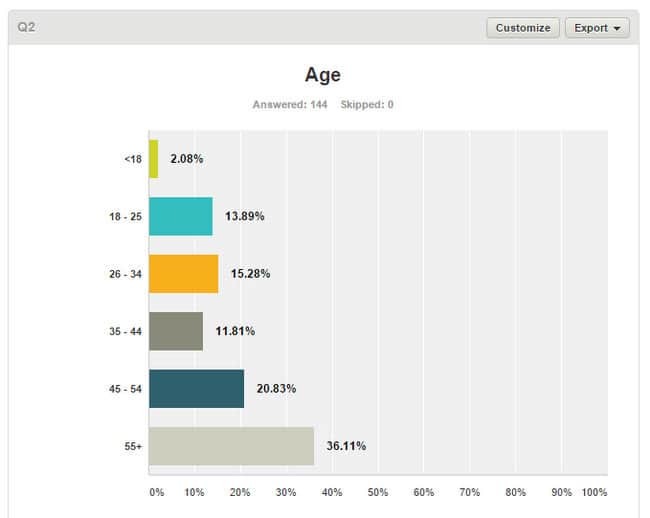 Are most of you in my age demographic (26-34). Are most of you out there women? I wanted to go beyond what my analytics tell me. 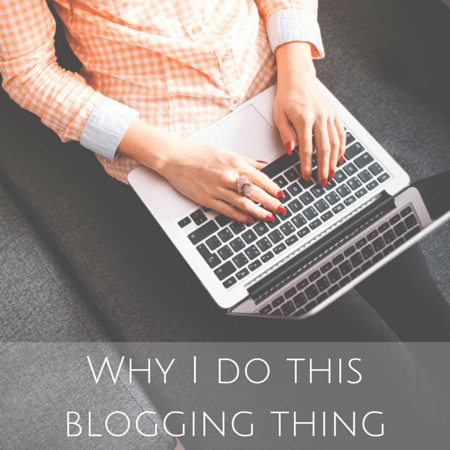 You’ve given me so many ideas and a lot of encouragement to keep on blogging! Here’s the quick rundown of the results. Let me point out one obvious point before we get into it. Reader surveys aren’t representative of a blog’s entire readership — I get a snapshot of just those who replied. In general the people that take the time to reply are the most engaged readers and not just people who search for something on Google, come visit one post once for 10 seconds and then peace out. Google Analytics can only tell a blogger so much — like what country you’re in and other stats — but not things like if you’re an expat, blogger, etc. Make sense? Who replied? I knew most of you would be female and as it turns out I had 81% of the responses come from women. It was interesting that the top age group of replies came from those 55+ followed closely by those who are 45-54 years old. Those two groups alone accounted for more than half of my blog survey responses. As I expected, the France/French culture content is your favorite. That makes sense since my blog’s main focus is about life in France. Second fave? Personal stories, followed closely by expat topics. Luckily I love writing about these topics and sometimes they even overlap. Also as expected, least favorite content is healthy living (46%) and dog content (44%). 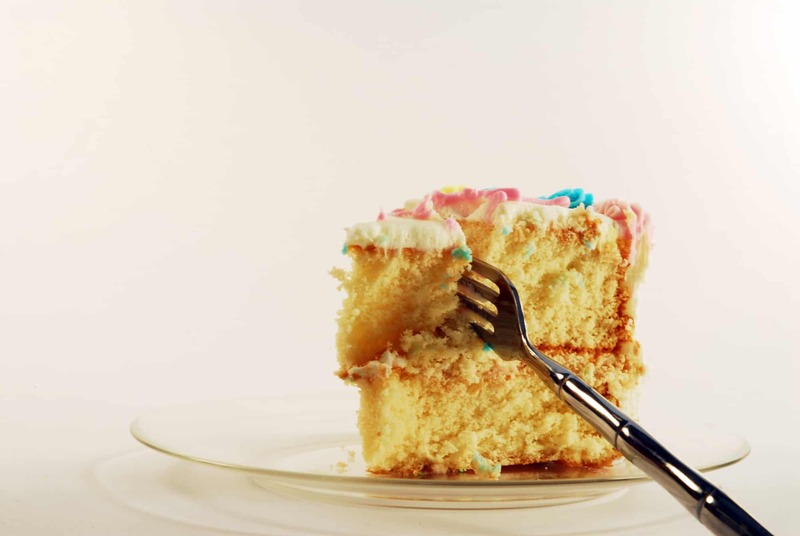 Some of the newer readers might be saying to themselves, “Well, I don’t see that much healthy living/fitness content here…” and you’d be right. You won’t see more than 1 post every month or so. Why healthy living? If you’re a new reader, you can get the scoop on that from over a year ago when I announced a shift in focus. 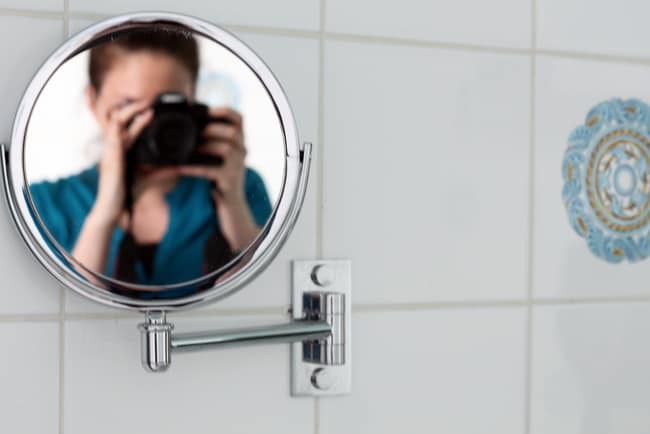 As I’ve mentioned before and as a few of you have noted, after spending several years in a country, the shiny and new aspects wear off and you tend to feel like you’ve covered the main differences and practical topics. So thank you to those who understand that and those who understand the need to branch out in terms of content (for my own sanity too!). Being an American in France is only one part of who I am. And only part of what I want my blog to be. Something that surprised me? 63% of you read my blog every time there’s a new post! Wow! 75% of you are NOT bloggers. 54% are NOT expats. Another surprising fact my survey revealed was that many of you are new(ish) readers. About half of the responses came from people who have been reading for a couple of months or less. Lots to say and think about. As many of you know, I take my blog seriously — probably a little too much sometimes — so getting your feedback was really important on a personal level. My blog has become part of my identity and something I really enjoy so it makes me so happy that you enjoy it too. I read every single comment and I took all of them into consideration as I continue on to create content you enjoy. Oui In France came to life as an outlet to share things about my life in France, so the France content isn’t going anywhere. I write posts that I’d enjoy reading and try to keep a nice mix of topics. Oui In France is just a hobby of mine, one that I don’t profit from aside from a few affiliate links that bring in about $5/month that barely cover hosting costs, but even still, I do my best to keep the content coming and I’m so glad you appreciate that. The survey wasn’t really about making big changes — some of you commented, “Don’t change anything, I like how it is!” — so rest assured it was more about my curiosity and not about overhauling anything. I built my blog around my identify in France so I know my readers are here primarily for that France content. I loved reading your comments in the very last question where I asked what you like best about the blog or what you’d change. You’ve given me all kinds of good ideas, some of which I’ll share, as well as encouragement to keep on writing. I wish I could work on my blog all day every day and make all of that content for you! I find it so hard to balance my personal life, hobbies and work with blogging. There’s not enough time to do everything! A few of you mentioned you really enjoy my husband’s posts (Ask Tom Tuesdays) and want to see more from him, so if that’s the case, please send him questions. He only writes when people have actual questions and no one has sent anything recently! Some of you said you’d like to see more videos and I agree! They’re fun but unfortunately very time-consuming (and scary to put yourself out there!) but I’ll do my best. One is coming soon! You can follow me on my YouTube channel here. 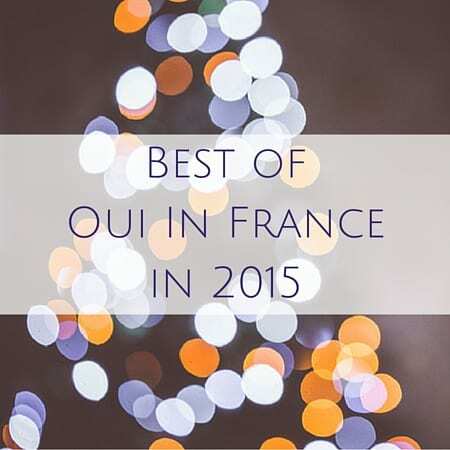 A quick favor please: Oui In France Reader Survey 2016 A shift in focus Looking back: Best of Oui In France in 2015 Why I do this blogging thing Blogiversary: Oui In France is 6 months old! « Are you happy in France?